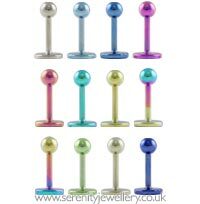 Hypoallergenic titanium labret studs secured by 2.5mm or 3mm screw-on balls. The flat back makes these studs particularly comfortable to sleep in. 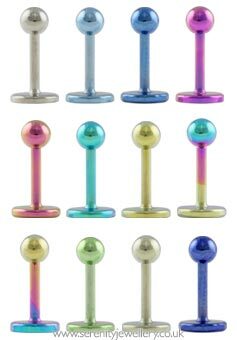 1mm or 1.2mm gauge labrets? The most comfy earring ever. The narrow gauge essential for us toe in the wster piecing types. I Was nearly going to give up on my helix but this sorted it out for good - thank you! It looks great, but I wish the ball was bigger. Lovely earnings for little ears. Good value for money. Have tried lots of other earrings but all managed to cause infections, ever since I started using these my ears have been fine, I'm so happy with them will definitely purchase again. I am impressed by the reasonable price and quality of these earrings, and speed of delivery, I will buy more of these, thanks for solving my allergy problem! 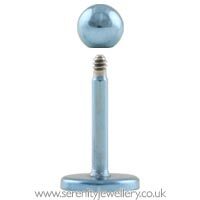 Perfect sized ball, no reaction in ear, excellent service, what more can you ask for! ? Fantastic colour and great price, never have any issues with these products, the materials used are fine for my sensitive skin. 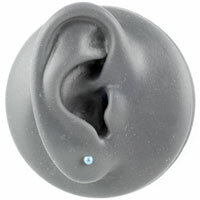 I initially purchased this for my lip, it was slightly long so used it for my tragus instead.